Designers Stefano Righini, Achille Salvagni and Francesco Guida have masterminded the four new models for Azimut which will be on display at Europe’s top international Boat Shows this summer and autumn, before heading to Asia. 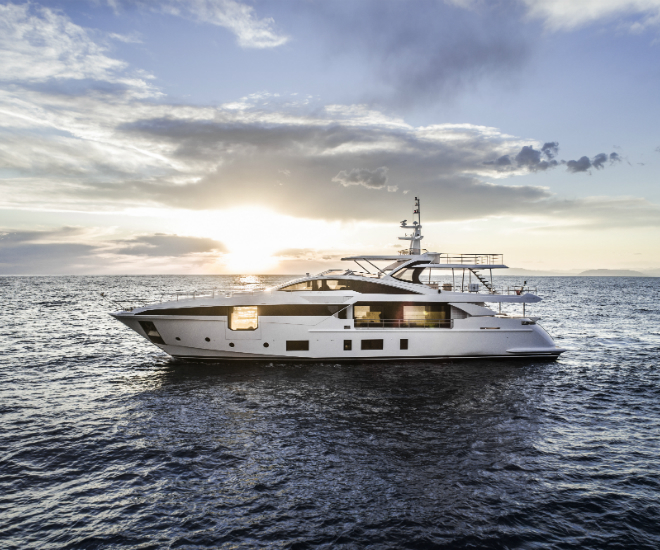 The four new Azimut yachts are all set to wow the international boating community: the Azimut Grande 35 Metri and the Azimut Grande 27 Metri are the newest in the Grande Collection, building the range outwards from the 120 SL and 95RPH. 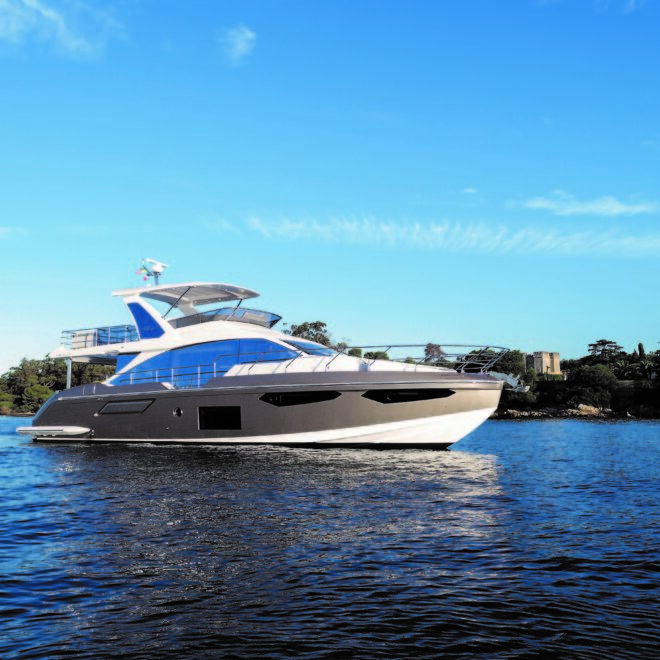 The Azimut S7 is an addition at 70ft for their Sports range and the Azimut 60 Fly is a new 60-footer with a cleaner hull and a much-improved flybridge. For those who missed the Cannes, Genoa and Monaco Yacht Shows, fret not! Yacht Style has reviewed the four new model boats on display at the recent Europe’s top international Boat Shows just before they made their way to Asia. The Grande 35M is the new flagship in the Collection and Achille Salvagni designed the interior to reinterpret classical features in a distinctive and yet unmistakably contemporary way. Stefano This yacht offers a wide body with a raised pilot house and supremely sleek exteriors. 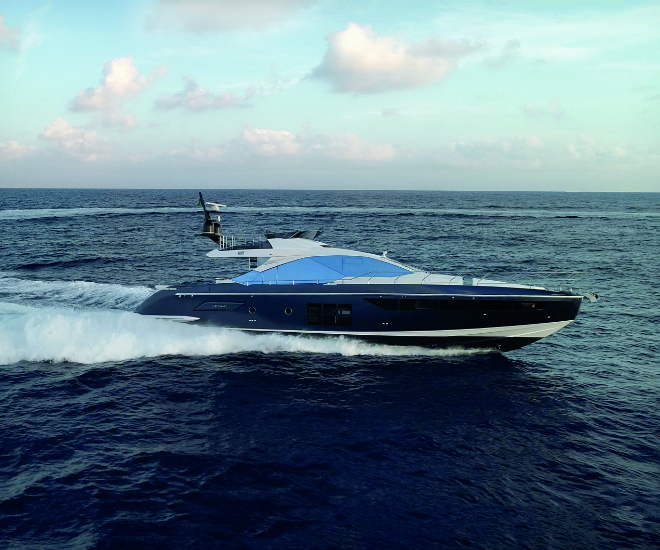 Drawing on Azimut’s command of carbon fibre technology, the yacht features exceptionally large full-height windows in both the bow and saloon. Unique in this category is the option to add an additional sundeck (almost 30 sqm) on a third level, with access from the upper deck in the stern, without affecting the balance of volumes or the model’s overall dynamism. The main deck houses the saloon that features a big circular sofa, and a radial arrangement of the independent components that characterise and define the space, without interfering with the necessarily oblong system of walls and windows. The main deck owner’s suite has floor-to-ceiling windows that give a sensation of openness and lightness. The king size central bed is a main feature, as is the unique private balcony that includes a mechanism to fold out the full-height window, while the floor of the balcony extends from under the cabin, protected by automatic pop up stanchions. The result is the Instant Balcony, with no uprights or other obstacles to spoil the panoramic view. Below deck, the layout includes four guest cabins (two doubles and two twins), all accessed from a big central lobby. One of the standout features of the Azimut Grande 35M’s interior is the backlit onyx spiral staircase, which connects all the decks from the lower deck to the pilothouse. Other exceptional features are the stern beach area and the side-opening garage that can take a 5m tender and a jet ski in its capacious full-beam space. This leaves the stern completely free for the beach area provided by the big pivoting swim platform. The trapezoidal bow (one of Righini’s hallmarks) provides plenty of space, and even more comfort throughout the area during both mooring operations and navigation. The D2P hull with wave piercer means the yacht can reach high top speeds without needing particularly powerful engines and can navigate in displacement mode with a remarkable range at a cost-effective speed. The hull has been optimised for the full range of most frequently used speeds, including both long-range displacement mode speeds of 10-12 knots and cruising speeds in semi-displacement mode. The Grande 35M, with two MTU 16V2000 M93 engines, rated at 2,400 hp each, has an estimated cruising speed of 21 knots and a top speed of 25.5 knots. Extensive use of carbon fibre in the superstructure has allowed the designers much more scope to expand the upper deck areas without compromising stability. Accommodation is for ten guests split across five cabins, including a full-beam main-deck owner’s cabin that benefits from extra space thanks to the vertical section of the bow as well as a fold-out superyacht balcony. Meanwhile the compact crew quarters provide two berths. On-deck relaxation options are plentiful, with a large foredeck seating area and a raised observation deck back aft. The Azimut Grande 27M has a top speed of 27 knots. The 70ft Azimut S7 is part of Azimut’s Sport collection, and is ideal for those who want performance without sacrificing beauty. The use of carbon fibre in the superstructure and the pivoting platform has allowed Azimut to maximise the volume of the boat while delivering excellent performance. She’s fast, silent, and extremely manoeuvrable, and can cruise at 30 knots. Her triple – yes, triple – 800hp Volvo Penta pod-drives will power her up to 35 knots, and with 3,400 litres in the fuel tank you can stay there for quite a while. The control panel looks like something on a modern jet aircraft, with auto-active trim control, auto fuel tank balancing, joystick driving, and an integrated Raymarine control panel that includes all major boat systems, and can be operated remotely from a tablet. The hull is the work of Pierluigi Ausonio Naval Architecture and Azimut, and again Righini and Guida did the design. There will be a coupé version as well. 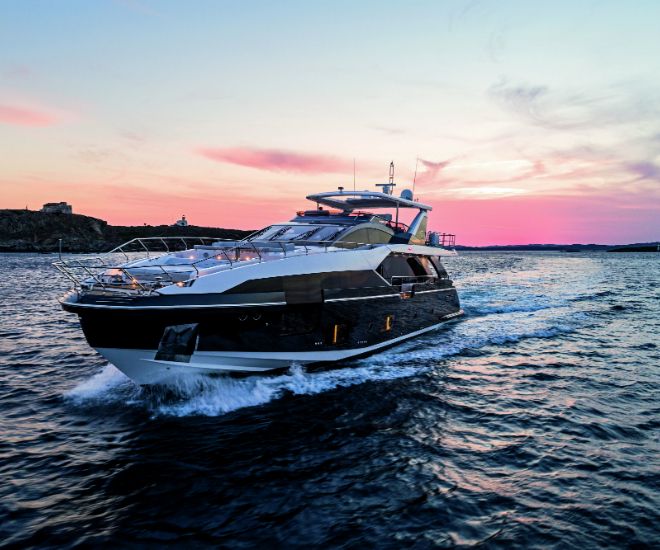 The Azimut Yachts Flybridge Collection is joined by the new 60, which has sleek and aggressively attractive lines, complemented by the the trapezoid bow, the big diamond-shaped windows in the pilot house, and the cutaway gunwales next to the saloon, providing an unimpeded sea view from the interior. The flybridge is much improved, with larger, cleaner, and more accessible space. The Azimut 60 Fly will be offered in two versions: Riviera and Gran Milano. In both, polished dark surfaces and woods alternate with surfaces and ceiling sections treated with light-coloured wood, and the extensive use of leather. The layout features three cabins and three bathrooms plus the crew cabin, while the two 800 hp MAN engines deliver a speed of 30 knots. If you prefer a couple of in-line 900hp Volvo D13s, she delivers a cruising speed of 28 knots and a top speed of 32 knots. For more information on Azimut Yachts, please visit www.azimutyachts.hk.